For lightweight loads for flexible horizontal movement of dies: When preloaded, the balls project over the table level by up to 2 mm. 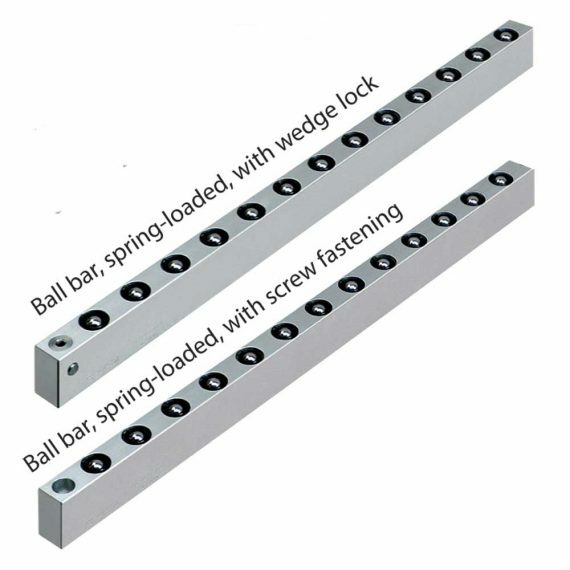 When the die is clamped, the balls are pressed into the bar body against the spring force until they are flush with the table level. Max. load-bearing capacity: 27 kN/m, flexible ball spacing. Any variable length in one-piece design up to 2900 mm. Fastening of the ball bar using a fastening crossbar or a wedge lock.